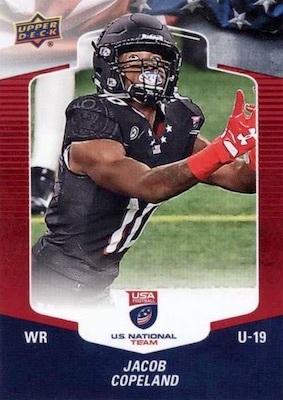 Young stars of the gridiron are waiting in 2018 Upper Deck USA Football. Once again exclusive to UD ePack, each pack purchased from Upper Deck's online platform contains an autograph or memorabilia card. And, yes, most of these represent physical cards via COMC (Check Out My Cards), including all the autographs and relics. This was the same in the 2017 set, as well. 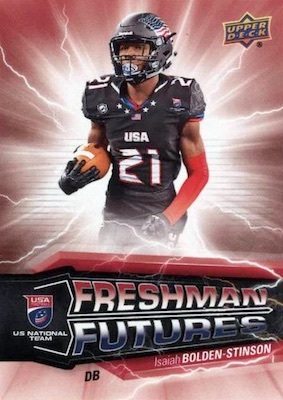 The 200-card base set covers the USA U17, U18 and U19 national teams, plus the Canada U19 team. 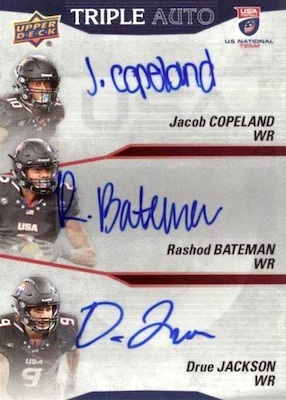 These are the only cards in the 2018 Upper Deck USA Football checklist that are solely found in the digital realm. However, if you redeem five copies of the same card, you can have a physical Red Border parallel mailed to you. As previously stated, all the 2018 Upper Deck USA Football hits represent physical cards. This includes the Base Autograph parallel (1:2 packs), U17 Autograph (#/99) and U17 Dual Auto (#/25) inserts. For the memorabilia fans, choices include U19 Future Swatch (1:5 packs), U19 Premium Swatch Auto (#/99) and U19 Premium Logo Swatch Auto (1/1) cards. 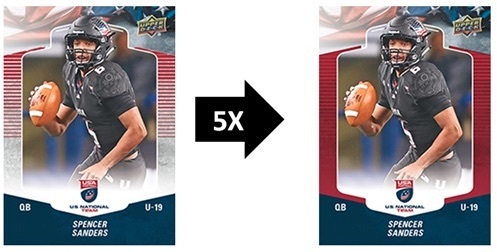 Like the base parallels, the 2018 Upper Deck USA Football achievements are not found in packs but instead are earned by completing certain tasks. 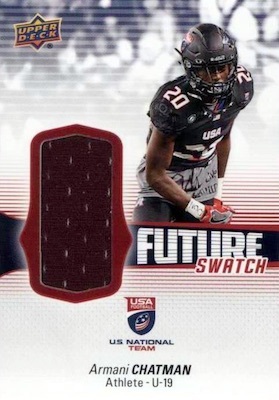 Collectors can unlock all the Freshman Futures inserts by redeeming the full Red Border base set. On top of that, the Triple Auto set is reserved for the first 35 collectors to redeem the entire U19 Premium Swatch Auto set. PHYSICAL PARALLEL CARDS: Red Border. 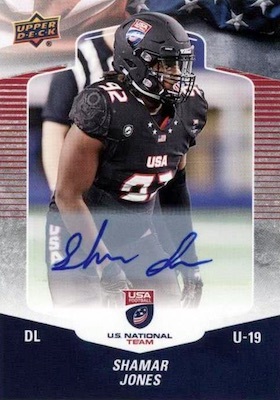 Shop 2018 UD USA Football autographs on eBay. DA-2 Kaevion Mack/Avery Howard Jr.
DA-5 Majik Rector/Desmond Sanders Jr.
DA-12 C.J. Niedzielski/Matthew Frauen Jr. PARALLEL CARDS: Logo Swatch 1/1. 8 cards. Not in packs. Earn Group A set by redeeming Red Border base parallel set for #1-100; Earn Group B set by redeeming Red Border base parallel set for #101-200. 7 cards. Not in packs. 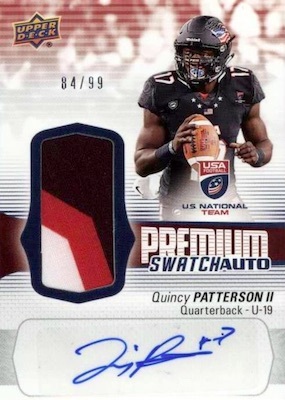 Earn full set by redeeming a complete U19 Premium Swatch Auto set. 2012 Upper Deck USA Football HOBBY Box Set-Jameis Winson,Todd Gurley-8 HITS!